Pity the fate of front-line politicians. Masters of all that they survey, they go from the centre of the universe to last night's chip wrappings. Imagine it. Your views matter. Your hobby horses matter. And your decisions are among the few that only, truly matter. Then, it might be sudden but is often drawn out, all this is revoked and you are bumped down to observer status. If you're lucky you might end up fondly remembered, but more often your name is indelibly associated with failures or catastrophes of one sort or another. The life after then, of getting stuck on the outside looking in at what was once yours, is a sad time of reflection in the dwindling twilight. Therefore only the hardest of hearts would fail to be moved by the plight of Dave, whose latest ruminations made all the papers today. We learn he wishes to rededicate his life to a resumption of public service. Good on him! I'm sure there are plenty of food banks and homeless shelters that would have his arm off. Quite literally in most cases. Alas, according to reports - subsequently denied - Dave had other things in mind. "I would very much like to return to front-line politics", our former PM declaimed, "and I should like to be foreign secretary". Giving the media the run around is so much jolly japes. 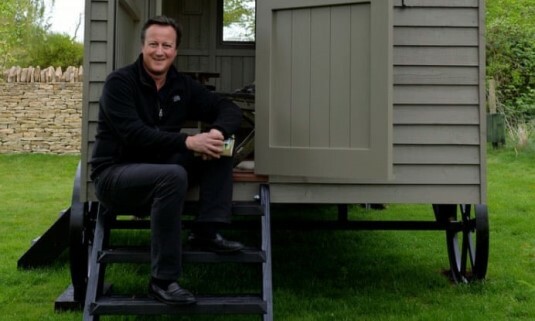 What's a washed up ex-leader of a declining power to do when one's memoirs didn't command the asking price, and one has just assembled a flash £25k shed? We all need a hobby. Unfortunately, Dave's story does have a ring of plausibility to it. We recall when Theresa May decanted George Osborne from Number 11 and then, almost over night, he manifested at the helm of the Evening Standard. Thanks to the largesse of Evgeny Lebedev (just what is it with Tories and Russian money? ), Osborne has preserved some measure of staying politically relevant, even if it is but a simulacrum of the power he previously dispensed. One can easily imagine Dave making a similar move. Readers might recall that his ambitions weren't driven by anything so quaint as "helping people" or "making a difference", but that he desired becoming Prime Minister because he thought he'd be "rather good at it". He has the same chutzpah as Osborne, the same unwarranted but effortless PPE confidence that he could glide into any situation and know what to do. Dave and Osborne typify the merry-go-round at senior management level across institutions and companies. One doesn't have to do detail (too much) as one set of meetings are much the same as the other, and if caught short an underling's briefing notes are always to hand. What matters are connections, and social and cultural capital they can bring to bear. Thinking it through, could Dave make a comeback if he was so moved? His chances look sketchy, no doubt. In times past it was possible for politicians to peak, decline, and peak again. Churchill is the most celebrated example, achieving ministerial prominence, fading from view, moving into Number 10, moving out, and then back in again when Attlee unnecessarily parted with the keys in 1951. Harold Wilson managed a couple of spells at the top, and there is the ghastly example of Silvio Berlusconi, the man who refuses to go away. It's been done before, so it's not impossible, on paper. But c'mon, this is Dave, the PM whose idea of "being rather good at it" saw the poor thrown under the austerity bus, imperilled the 300 year old Act of Union, and gambled away EU membership to prevent a ridiculous, rag tag and bobtail outfit of "fruitcakes, loonies and closet racists" from coming near to getting a handful of seats at Westminster. It stands to reason that there might be a few things standing in his way of getting a Foreign Office job. Unfortunately, we can't count on good sense keeping Dave out of the way as this isn't the first time a return has got mooted. It wasn't very long ago when Theresa May allowed his name to be floated as her nomination for NATO general secretary. We're not going to see her do that again, but as her career threatens to go the way of Dave's and Osborne's what is there to stop a future Tory leader from ennobling him and letting him loose to raise more fresh hell and do more damage? Sadly, regrettably, I have a feeling Dave's time with British politics isn't quite yet over. Unfortunately the return of Dave seems inevitable. According to recent media reports (taken with a pinch of salt obviously) he wishes to be foreign Secretary in the next conservative government cabinet. Could this be his stepping stone back to No10? After all, he is Vice-chair of the Uk-China fund, though not many will know that. Even less will know that he is considered to be "One of the most prominent global influences of the early 20th century" according to the Washington Speakers Bureau. I come from a trading background, and when you make a big call and screw upon such an epic scale, there really is no way back. Some businesses are battles of the big beasts. Battalions line up behind leaders who can deliver. Fail, and you will never be allowed to be a big beast again. There may be a job around, but it will be pretty clear its just a job to be compensate for failure, not a job that matters. No-one will let Cameron speak on behalf of the UK again. He did two things wrong. Firstly, he committed to a renegotiation and campaigning for Remain on the basis of that negotiation so putting him in a place where he was fully committed to an outcome which he didn't control and had no plan B. Secondly he made an important decision in haste. The maxim that, after a nights sleep, nothing is ever as bad, or as good, as it seemed the previous night, was surely true here. He should have stayed to agree a route out. Even if that was to park in EEA or EFTA or whatever. I know a few Tories, and I won't raise the issue with them as I would just look stupid (no comments necessary). You can be right and lose if you are on the left and still be somebody, but there isn't any space for Losers on the right, no matter how right you might think you are. Toryism is a way of governing rather than a specific set of policies, so screw that up and there is no way back.